We all want our kids to understand the value of money and to know how to invest it wisely. This may be too much to ask. Children and teens like to live for the moment and act impulsively with little thought for what will happen tomorrow let alone next month or next year. 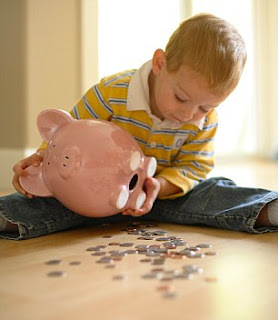 The seeds of financial knowledge that you sow now will benefit your child in years to come. They will grow in financial confidence and be comfortable with investments. It is never too early to start their education. The financial intricacies of investments will be beyond the grasp of most toddlers but they are not too young to understand what investment means. They can learn to appreciate that an investment is something that pays out in the future. There are many different types of investment. Show them that if they invest in learning a new skill such as hopping on one leg or skipping, the payout is being able to do it well and show off to their friends. If they invest some time in planting a seed, the payout will be a pretty flower or some tasty vegetable. This teaches them that not everything gives immediate satisfaction. Sometimes, you have to wait for the good stuff to arrive! At this age, kids can start to learn about companies. They are naturally curious and ask a lot of questions at this stage of their cognitive development. Sometimes they ask the same question over and over again just to check that they understand, or that you have not changed your mind! Try to relate companies to their everyday life. Talk about the company that made the car that you drive them around in, the soda that they like to drink or the toy that they like to play with. Point out brand names and logos on labels. Discuss who owns the company and explain that a lot of people all own a tiny bit. Point out that they could own a bit if they wanted to. They are old enough to grasp that a ‘bit’ of a company is called ‘stock’ and that when people buy stock in a company, they own a little piece of it. They will also love to hear about the dangers of investing everything you have in one place. Use a hypothetical example that they will understand. Perhaps you could describe a toy company that only sold one type of toy. What if kids got fed up of that toy and started playing with other things? The company would be in trouble because it does not sell anything else. This simple tale teaches the principle of diversification in investments. Teach them the difference between gambling and investment. Show them that slot machines are gambling but buying stock is investing. Talk to them about probability and chance and give them a practical example using dice. Let them roll it! Older kids can fully understand what investment is all about. They will be learning about compound interest in school and will be able to relate this to compound investment. The money you make on your initial investment is called the principal but it doesn’t end there. If you reinvest it, you can make even more money and repeat this over time for maximum returns. Investments are a great way to teach your kid math. Take the investment "rule of 72," which you can use to calculate how many years it will take to double your money if it's earning interest or is invested in the stock market. If they are really smart they can look up how the formula is derived. Math lessons have never been so much fun! It is important to talk to kids of both genders. There is a common misconception that boys understand complicated mathematical concepts quicker than girls but this is simply not the case. This is the age where kids can stop talking about investments and can actually get involved themselves. Introduce them to Fortunate Investor and let them do their own research into how to invest their own money. Then support them in making their own decisions. Of course, they need a pot of money to start off with. Help them to find a part-time job that they can fit in around their school work. Once they get used to investing they may be able to give it up! The knowledge and skills that they acquire will be so useful for securing their financial future.